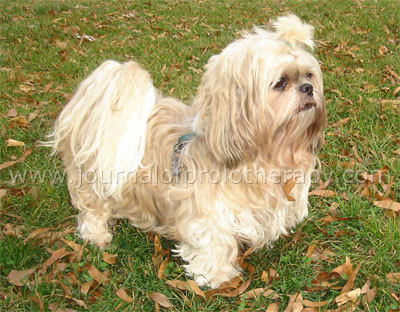 Canine Hip Dysplasia (CHD) is a significant health problem among all dogs. It has been estimated that up to 30% of the canine population are effected. As a result, one of the most frequent applications of Prolotherapy involves the hip area. Preventative therapies can play a large part in the management of nonsurgical CHD patients. 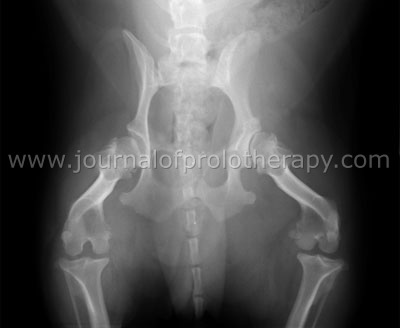 This article reviews canine hip dysplasia cases treated with Prolotherapy. Canine Hip Dysplasia (CHD) is a significant health problem among all dogs. It has been estimated by many veterinarians that up to 30% of the canine population are afflicted. As a result, one of the most frequent applications of Prolotherapy and related treatments involves the hip area. Here are some of my most recent cases. In each one, the Prolotherapy solution comprised equal parts 50% dextrose, 2% lidocaine, vitamin B12 and Heels’ traumeel. The injections were usually given at the dorsal and lateral aspect of the hip, in one or both hips. Typically, four injection sites were utilized, in and around the articular capsule surrounding the femoral head. Treatment protocols (the number of Prolotherapy sessions) were determined by the physical findings, as well as the response to treatments and the cessation of clinical signs. The addition of ACell’s MatriStem®was introduced at the end of the traditional Prolotherapy sessions and seemed to accelerate the ultimate progress of the case. This treatment, a natural three-dimensional extracellular matrix (ECM), facilitates healing through several mechanisms. It creates an optimal environment for the body to regenerate site-specific tissue, promoting cell growth and renewal by, amongst other mechanisms, attracting different types of collagens and growth factors. It also enhances healing with anti-bacterial, anti-inflammatory and analgesic properties. Typically, the first session would show some progress. After the second session, more progress would be visible. By the third, the clinical signs were mostly resolved. The fourth session of ACell was the one that proved the most significant: the animal would be as near to normal as possible considering the pathology of the case. Bejinos is a charming Tibetan spaniel with the breed’s regal bearing and energy. Yet upon examination, the nine year-old spaniel was lame and not his cheerful self. Bejinos presented with lameness in his right hind, registering as a 1 out of 5 on the lameness scale. Physical investigation revealed pain and crepitus in the hip area around the femoral head. Other factors, such as tenderness between the femur and tibia at the knee, and laxity of the patella, contributed to his condition. The problem was compounded by the wear and tear on Bejinos’ left side. The elbow and shoulder on that side were stiff and sore, problems directly related to overuse. In his first Prolotherapy session, Bejinos received an 8cc injection of solution. In the same session, his right knee was injected with 4cc of solution at the following sites: the lateral tibial collateral ligament, under the infra patella bursa, into the tendon of the long digital extensor and deeply into the joint space under the patella ligament. A week later, Bejinos underwent an identical second treatment. After this treatment, his lameness issues resolved to a mild stiffness. He was still slightly painful on palpation of the hip area one month later. The owner reported that Bejinos’ improvement was promptly apparent. “He plopped down a couple of times in the first week but he hasn’t done that for a while.” At this third session, Bejinos received 5cc of ACell’s in the right hip and knee. In Bejinos’ case, the results were clearly evident, with the compact dog quickly regaining his playfulness and energy. His grateful owner told me “Bejinos is really doing well as far as running around and being peppy. It is wonderful to see. He is spry again. Love it!” His case underscores the value of a combined regimen of Prolotherapy and stem cell injections. Subi, the little Shitzu, was clearly uncomfortable at her first visit, with lameness scores of 2 out of 5 coupled with a grade 4 of 5 bilateral patellar luxation. On physical examination, minimal cranial draw on both knees was noted, but mild extension and flexion of her right hip elicited a pain response. Palpation around both coxofemoral joints produced discomfort, as did slight manipulation of the right stifle joint. 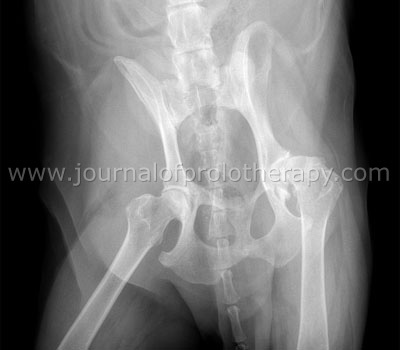 X-rays of the 10 year-old, slightly overweight dog showed severe bilateral hip dysplasia with subluxation of the right hip. (See Figure 1.) Her previous vet had already prescribed Metacam® and tramadol. Following discussions with her owner, we decided to take her off the medications and begin a regimen of Prolotherapy, omega-3 fatty acids, Adequan® injections, and a course of natural anti-inflammatories. In addition to this program, Subi received a course of three Prolotherapy sessions in each hip using 4cc of the formulation given at three week intervals. Subi’s right knee was injected with 2cc of the same solution, at the lateral tibial collateral ligament, under the intrapatella bursa, into the tendon of the long digital extensor, and deeply into the joint space under the patella ligament. The results of Subi’s Prolotherapy treatments and her maintenance program have been gratifyingly pronounced. Although still mildly stiff, Subi soon began to run and play again, exhibiting a near-normal range of motion and functioning. Her owner had not seen this type of behavior from her for at least two years. Subi was seen for a check up 11 months after her initial visit. She was found to have mild pain and crepitus around the right coxofemoral joint. Her left hip, however, seemed normal. Both patellas were found in place and there no signs of draw on either knee. As maintenance, she received one Prolotherapy treatment followed by a second treatment administration of ACell (5cc), in both hips, two weeks after her Prolotherapy. Figure 1. Subi’s X-ray shows bilateral shallow acetabulums and a right femeoral head subluxation, with a thickened or remodeled femoral head and neck indicative of degenerative joint disease. Subi, 10 year-old female spay Shitzu, enjoying fall in the park. Fortunately, since Hazel’s new adopted family lived in a Manhattan townhouse with many stairs, the Humane Society opted to treat the condition prophylactically. The chosen course of action involved a Prolotherapy treatment with 10cc of solution. As with the other CHD cases, the treatment was injected at the dorsal and lateral aspect of the hip at four sites in and around the articular capsule surrounding the femoral head. In Hazel’s case, like Subi, the treatment was administered to both hips. Again, the results were profound. Within a week, Hazel had been more active, sitting down less often, and now being willing to go up or down stairs. There seemed to be less tenderness in the hip joints. A second session was followed up with ACell, 6cc in both hips, two weeks later. Hazel was now ready for her new home. Her owner has scheduled more treatments to maintain Hazel’s improved condition. Figure 2. Hazel’s X-ray shows bilateral shallow acetabulums and subluxation of the femoral heads. No remodeling of femoral head or neck is visible at this time. 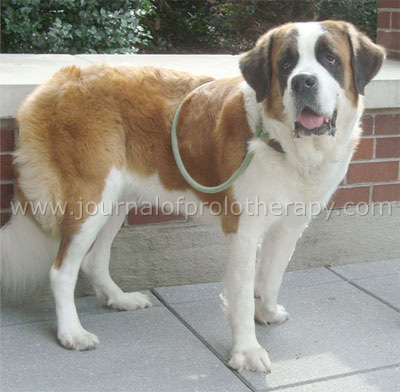 Hazel, 2 ½ year-old female spay St Bernard, is much happier after Prolotherapy. Several months ago, Buddy, an 11 year-old chow mix at the New York City’s Humane Society, presented with hip dysplasia and little hope. Palpation showed how much pain he was in, with touching hind legs and an inability to get up and down comfortably. (See Figure 3.) He was basically walking on three legs, and was only using one hind leg for balance. Buddy’s immediate treatment included two Prolotherapy sessions, given at two week intervals and followed by a third treatment of ACell injections. 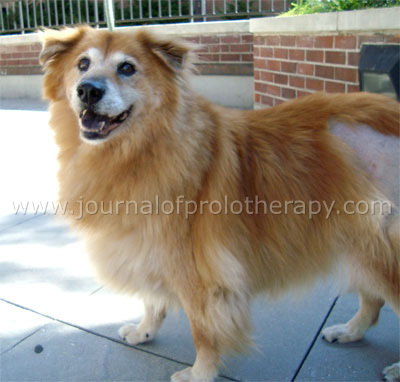 In Buddy’s case, Prolotherapy consisted of a 7cc solution. As with the other dogs discussed, Buddy was injected at the dorsal and lateral aspect of the hip, in and around the articular capsule surrounding the femoral head. Both of Buddy’s hips were treated. In the weeks following treatment, Buddy made considerable progress. He was able to get up and down more easily and no longer needed pain medication. He now runs along happily on his daily walks and the closeness of his hind legs has gradually lessened. They now stand about four to five inches apart. He is bearing weight on all four limbs. A third Prolotherapy session on both hips recently has helped with some residual soreness at the top of the left coxofemoral joint. But the success of his Prolotherapy treatment is not the only good news for Buddy. He has recently been adopted and is going to a new home along with his long time companion, a yellow lab mix. Figure 3. Buddy’s X-ray shows a left femoral head and neck with a thickened and remodeled. 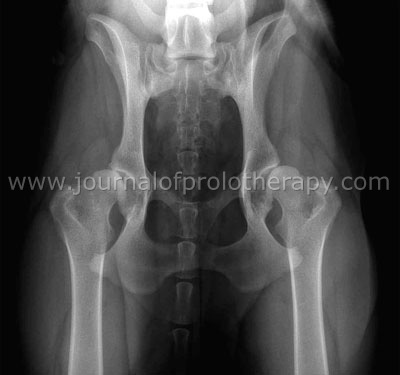 This is indicative of degenerative joint disease and hip dysplasia. Buddy, 10 year-old male neuter, happy to be running and playing. 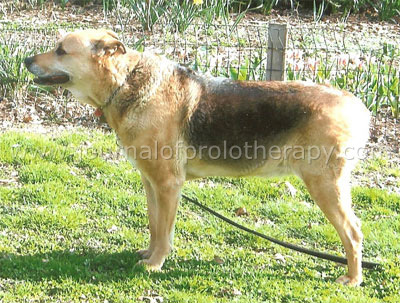 When I first saw him, Shadow was suffering badly with dysplasia, as you can see in Figure 4. Stairs were out of the question for this 10 year-old German shepherd mix and his owner, upset by Shadow’s deteriorating mobility, built a 100 ft ramp behind her Brooklyn brownstone so that the much-loved dog could get out to the yard. My recommendation was to treat Shadow over three Prolotherapy sessions, administered at two week intervals. At each session, he received a 7cc injection in each hip area. Shadow’s fourth session included a treatment of ACell. The very first treatment required that Shadow be anesthetized and this was done with .7cc of Telazol®. Shadow was also placed on weekly Adequan® shots to help him with his arthritis. Figure 4. Shadow’s X-ray shows bilateral shallow acetabulums with a thickened or remodeled femoral heads and necks, more severe on the right hip. This is indicative of degenerative joint disease and the cause of his lameness. Shadow, 10 year-old male alter German Shepard mix, in his park yard. Preventative therapies can play a large part in the management of nonsurgical CHD patients. By creating the greatest possible musculoskeletal support and keeping the hips pain-free, good range and function are maintained. This support can delay or possibly prevent degenerative joint disease. Therefore, CHD patients benefit from early detection and treatment with Prolotherapy.